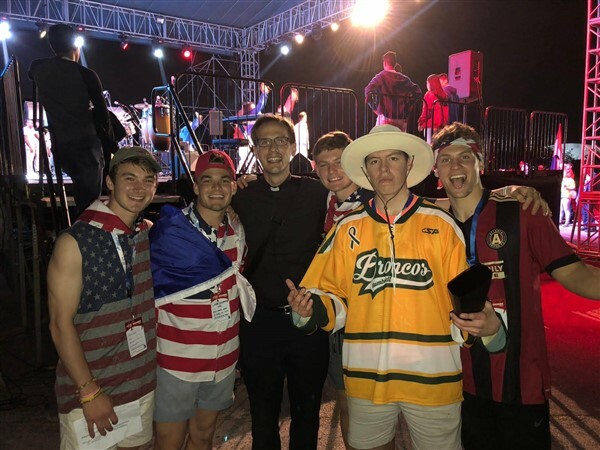 Jack Bohling, Lily Cabrera, Watson Casal, Nolan Gibbs, and Sarah Gunderson, chaperoned by Denise Gunderson and Father John, made a pilgrimage to Panama for World Youth Day 2019. 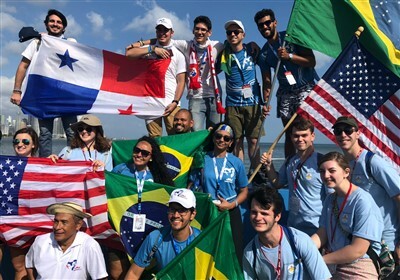 Joined by a number of other pilgrims from the Atlanta Archdiocese, our pilgrims started their journey on Monday, January 21, and spent a week in Panama experiencing the universality of our faith and the Church with over 700,000 other young people from around the globe. At the start of their pilgrimage, the group celebrated Mass in the Miami airport while waiting for their next flight, using a suitcase as an altar. "People walking by were definitely staring at us with confused faces, but I was proud of what we were doing," remembered Lily. "One lady stopped, crossed herself, and kept walking." Once they arrived in Panama, our pilgrims visited churches, attended festivals, and listened to speakers talk about their journey in Christ. One notable speaker was Sister Bethany Madonna, who told a story about how she lost her high school friends when she didn't go to a party with them. She remembers being so lonely during that time, until a girl invited her to a Catholic youth group. That's where she started her journey and became a nun at 22 years old. Sister Bethany Madonna was a favorite of the group, especially among our students. "She was really good at making her talk relatable to young people," said Sarah. "We took a selfie with her afterwards!" Of course the most notable speaker of World Youth Day was the Holy Father Pope Francis. Our pilgrims were able to see the Pope on three different occasions, driving by at arms-length in the Pope-Mobile. The main theme in his homily for all the young Catholics in attendance was: "You are not the future, you are the now." He encouraged young Catholics to stand up for their faith and be present in society. Father John had the opportunity to perform several times throughout the week, inciting a dance party whenever he did. He sang worship songs and pop songs with the help of some missionaries, dancing and singing along with him on stage. "Even people who couldn't understand the words to his songs were dancing along to Father John," recalled Lily. On their final day in Panama, our group made a nine-mile pilgrimage to the site where they would spend the night in an open field and awake together the next morning for Mass celebrated by Pope Francis. Father John brought two plastic stools (the traveling confessional) and stayed up until 3:30am hearing confessions. The rest of our pilgrims mingled with those around them, trading bracelets and flag pins with pilgrims from other countries. The wake-up call came at 6:00am over the loud speaker and was followed by Mass at 8:00am. Despite the mass of people, our pilgrims were able to find a Eucharistic Minister and received communion consecrated by the Pope.